Hmm…I thought buckeyes were made from chocolate & peanut butter! Great shots. I grew up in Ohio & remember finding those in the woods. Great series of photos! Great pictures! Now I know what Buckeyes look like. Aww loved them:) nice shots! These don’t have as many calories. how interesting–I never knew that they existed!! YUM. I never knew they existed either! No, not YUM! The buckeye is poisonous. 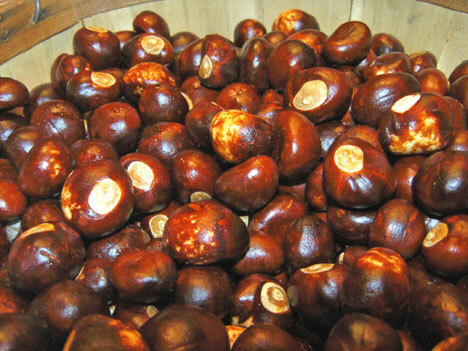 Buckeye nuts contain toxic chemicals. The leaves and sprouts are toxic, too, especially in early spring. If the chemicals are ingested you may get terribly sick with stomach, intestinal or nervous-system problems. Vomiting, muscle spasms, coma and even death may result. Just look, and wash your hands after you touch. They make great necklaces, key chains and earrings for an annual football game against a team somewhere in the north. I had no idea what a buckeye was.. but thanks for filling me in… what a great shot… GO BUCKEYES!! Mmmm chocolate and peanut butter buckeyes! My grandma used to make them and I attempted them once, and only once, in college. The process took hours and toward the end I made them the size of golf balls just to get it over with. I think that experience is one of the major reasons I donâ€™t cook. Yes, CrankMama, much better to leave that to Grandma. My Mom made them — every Christmas. I miss being around while she made them — and I cannot make them myself. 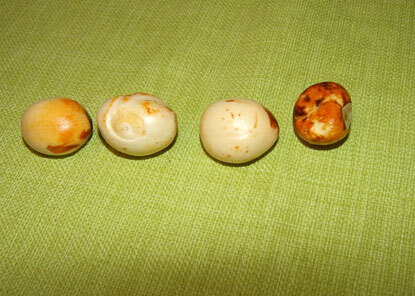 They remind me of the kukui nuts in hawaii that they also make necklaces or leis from. They shine them up and paint flowers on them sometimes. I grew up in Ohio – I love buckeyes. Especially the choclate peanut butter edible kind! Buckeyes – the chocolate and peanut butter kind – are my speciality! 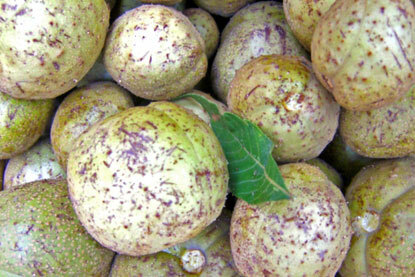 When I first saw the pictures, I thought they looked like chestnuts! 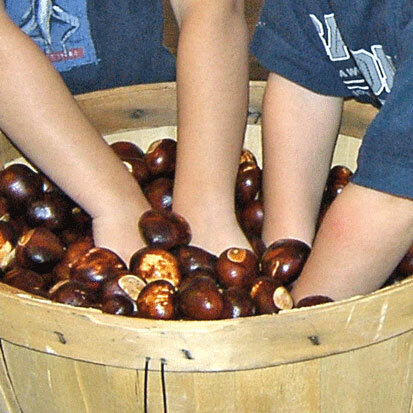 We just gathered chestnuts over the weekend. Now those are yummy! I used to have a whole bag of buckeyes that disappeared after one move. I’d never seen the early stages like that though. Cool! no no no – buckeyes are chocolate covered peanut butter yumminess!! !